Shimano has announced additions to its XTR and Deore XT 1×11 drivetrains. Most significantly, there’s a new retention ring and an 11-46 tooth cassette coming this summer. 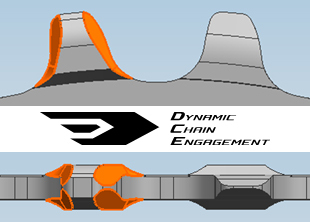 The modified tooth profile on the CRM91 and CRM81 “Dynamic Chain Engagement” chain rings is designed to keep the chain on with lower driving noise and increased durability. With steel-plated teeth, the XT version will be the more durable option, while the lighter XTR ring will sport aluminum teeth. The more significant news is that Shimano has expanded its 11-speed gear range with an 11-46T cassette. The CS-M8000 has a target weight of 450g–portly in comparison to SRAM’s 268g 10-42T XX1 cassette, though it’s likely to cost significantly less. Unfortunately, Shimano does not yet have an image of the new 11-46T dinner plate. 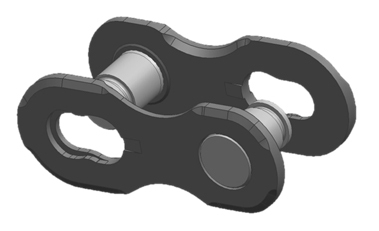 Also new, the SM-CN900-11 is a tool-free chain link compatible with all 11-speed Shimano chains, promising easier trail-side repairs. Shimano also announced new gear combinations for 2×11 and 3×10 cranksets, new low-end, non-series hydraulic disc brakes as well as a disc brake rotor lock ring promising easier assembly. These new products are set to be available this summer. Pricing has not yet been decided.